The Low Force Trimmer from Swingline boasts powerful precision. This guillotine trimmer cuts up to 40 sheets of 20lb paper. Its 14" cutting arm accommodates everything up to legal size paper. Using the automatic clamp mechanism to secure papers, you can trim paper, presentations, flyers, large projects, office documents, and more! Product number SWI-98150. Great at holding multiple pages in place while precision cutting of the slightest sliver of paper. Just have to be very careful where you place the edge to cut as you cannot see entire paper due to hold-down bar. With practice, you figure it out. Cutter used in an office and we all love it. Welcome to MyBinding Video. 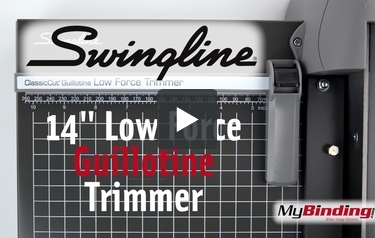 This is the 14” Low Force Guillotine Trimmer from Swingline. This trimmer boasts incredible power and precision. It’s a sleek, solid metal design that offers safe, reliable operation. To attach the plastic guard, set it down over the two hex head bolts, and push toward the base of the blade to lock it in place. The blade comes locked down for safety, to release it just flip the metal safety lock down away from the handle. The adjustable edge guide is locked with a lever at the base of it, and can travel the entire width of the trimmer. A unique feature that helps you make a perfect cut without slipping is the automatic paper clamp. Lifting the blade all the way up, opens the paper clamp so you can set your papers where you want, then as you drop the blade back down, the clamp holds your pages right where they are as they’re trimmed. This is particularly important when cutting the maximum 40 pages, as those would typically slip to some degree. This is an extremely well thought out design and Swingline backs it up with a 1-year warranty. You won’t be disappointed. For more videos and all your binding needs, visit MyBinding.com. Is there a larger version of this cuttter (with maybe an 18 or 20 inch cut length)? Unfortunately, at this time, we only have the 14" cut but we condifering expanding the line to a larger length. The trimmer handle is getting harder to lift. Can or should we spray a silicone lubricate at the bolt on the end of the trimmer? Should a lubricate be used a couple of times per year? You shouldn't have to lubricate the hinge unless you have owned the trimmer over 5 years. Where do I find a replacement plastic shield? Hi Shell - thanks for your question. The shield can be replaced, but unfortunately we do not sell shields separately. Where can I purchase a plastic gaurd for my trimmer? Hi - thank you for your question. While the plastic shield can be replaced, we do not sell them separately. What is the vertical gap under the paper guard? Is this adjustable? gap is .16" and is not adjustable.